Rep. Rosemary Brown (R-Monroe/Pike) spoke about her plan to promote personal financial savings through raffles at a press conference recognizing International Credit Union Day at the Capitol on Tuesday. 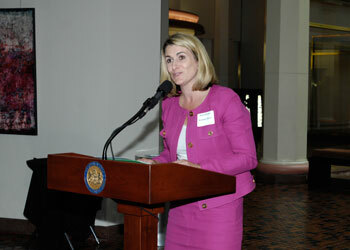 HARRISBURG – Rep. Rosemary Brown (R-Monroe/Pike) spoke about her plan to promote personal financial savings through raffles at an event recognizing Credit Union Day at the Capitol on Tuesday. Savings Promotion Raffles are offered by certain financial institutions, such as credit unions, where the customer receives a chance to win a prize when he or she deposits a certain amount of money into a savings account. Studies have confirmed that nearly half of American households (44 percent) have insufficient savings to cover three months’ of expenses. A quarter of households earning between $55,465 and $90,000 also lack this financial cushion, Brown explained. Further, approximately nine million American households are unbanked, meaning they do not have any accounts at a bank or credit union. Currently, 10 other states in the U.S. operate similar programs to the one Brown is working to establish in Pennsylvania. Participants in those states have mostly shown signs of positive improvement, including a 35 percent increase in fund balances, on average, she noted. Each credit union would create its own program. An example of how similar programs in other states are run would be: A raffle is offered as 12-month Certificates of Deposit in $25 increments. For each $25 deposit, the participant could receive one entry in the raffle. Drawings for grand prizes could happen once a year and monthly drawings could be held for smaller prizes. For example, Michigan has a program that offers six $10,000 grand prizes each year. This plan would be implemented at no cost to the Commonwealth, as the legislation would authorize the credit unions to provide the raffles, and the funds for the prizes would come from those establishments. For more information about Brown’s plan to establish savings promotions raffles, or any state-related issue, contact her district office in East Stroudsburg located at 696 Seven Bridge Road, Suite 101, East Stroudsburg, by calling 570-420-8301. Information on current legislation can also be found on RepBrown.com and Facebook.com/RepBrown.